#KU PG Admissions 2017,SDLCE KU Distance Degree,PG Admissions 2017,Kakatiya Distance Degree, PG Courses 2017 Admission Notification released. SDLCE KU Degree, PG Admissions 2017, Kakatiya Distance Degree, #PG Courses 2017, kakatiya university distance education notification 2016-17, kakatiya university distance education courses offered, ku sdlce exam time table sdlce ku results 2017, sdlce ku degree results 2017, sdlce ku hall tickets 2017, sdlce ku hall tickets 2016 download sdlce ku pg results 2017. Kakatiya University Distance Education admissions , entrance tests , KUCDE Course Degree Admission schedule , kakatiya.ac.in , ku distance PG courses 2017-18 , ku entrance test notification , sdlce.co.in , telangana , TS KU Distance Education Admission dates. Kakatiya university district mode entrance test Notification for Admissions into various distance mode education courses as declared for the academic year of the 2017-18. The candidate who is interested in the distance education and not applied yet can start applying at the official page. This is good for the candidates who did not able to do the regular course or those who are doing the job and also doing UG/PG degree simultaneously. Application forms will available soon on the official link. Postulants have to apply before the last date after that link will be disabled. The association offers various courses for the aspirants like Bachelor’s/Master’s/PhD and many others. Name of the University – School of distance learning and continuing education (Kakatiya University). Exam Name – Kakatiya university district mode entrance test 2016. Name of the Course – Various UG and PG. 1. Application forms and prospectus can be downloaded from www.sdlceku.co.in &nbsp;or obtained from SDLCE Head Office, KU or from the SDLCE Study Centres. 2. Registration Fee for PG/PG Diploma / Diploma/ Certificate courses is Rs.250/- for UG is Rs.200/- and for M.Sc. Physics, Botany, Zoology, Chemistry/ PG Diploma in Guidance and Counselling is Rs.500/-. 3. The fee can be paid through challan at SBH Ext. counter at SDLCE only or can be paid through DD drawn in favour of the Director, SDLCE, KU, Warangal from SBH / SBI / Andhra Bank payable at Warangal. 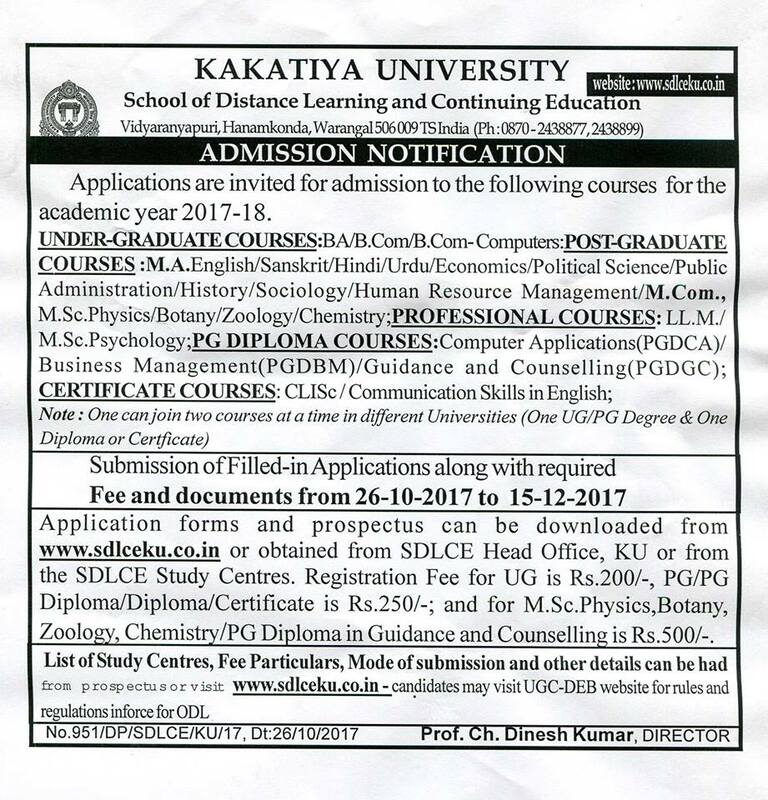 Kakatiya Distance Degree, PG Courses 2017 Admission Notification released ku distance education for degree 2017 ku distance education for PG ku sdlce 2017 notification ku sdlce degree admission test 2017 ku sdlce degree notification KU SDLCE for degree courses 2017 ku sdlce for diploma notification ku sdlce for UG & PG 2017 ku sdlce pgku sdlce PG admission test hall tickets www.sdlceku.co.in SDLCE KU Distance Degree, PG Admissions 2017. KU Distance Application form download.